If President Obama had a son, that son wouldn't have a future as an NFL player. President Obama doesn't have a son, but if he did, he wouldn't let him play pro football. The president disclosed that fact in the latest issue of the New Yorker, where he also compared playing football to smoking. 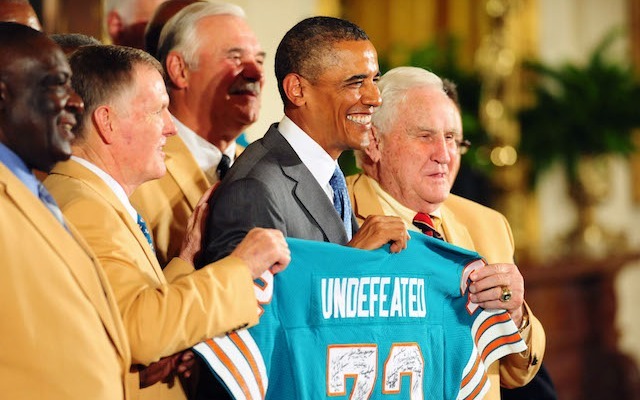 "I would not let my son play pro football," Obama said. It's important to point out that Obama said pro football, meaning there's a chance he'd let his son play Pop Warner football. Before the Super Bowl last year, Obama said that he'd think about letting his son play football. "I'm a big football fan, but I have to tell you, if I had a son, I'd have to think long and hard before I let him play football," the president said in the days leading up to last year's Super Bowl. The topic of Obama's son playing football came up in the New Yorker interview when he was asked if he had any mixed feelings about being a fan of the NFL given all of the research that's linked playing football with concussions, early onset dementia and degenerative brain disease. That led the President to compare players in the NFL with people who smoke. Obama's belief is that people doing either of those things understand the risks behind it. "At this point, there's a little bit of caveat emptor," Obama said. "These guys, they know what they're doing. They know what they're buying into. It is no longer a secret. It's sort of the feeling I have about smokers, you know?" There might not be a little Obama running around on the football field, but there will definitely be a little Harbaugh. Niners coach Jim Harbaugh said last year that his kids will be allowed to play the sport. "I have a 4-month-old, almost 5-month-old son, Jack Harbaugh, and if President Obama feels that way, then there will be a little bit less competition for Jack Harbaugh when he gets old," Harbaugh said before last year's Super Bowl. "Jack is only 5 months old. He is a really big kid. He has an enormous head. We don't have a 40 time on him yet, but his wingspan is plus one, and as soon as he grows into that head he is going to be something. It's early, but expectations are high for young Jack."